“Dry” Macular Degeneration and “Wet” Macular Degeneration are the two most common types of age related macular degeneration that we typically see at Baltimore Washington Eye Center. What is “Dry” Macular Degeneration? Dry Macular Degeneration is also called Atrophic Macular Degeneration and is the most common type of age related macular degeneration. 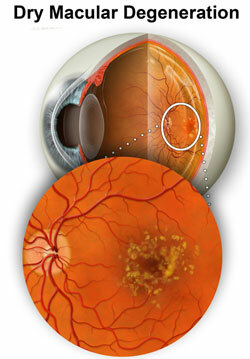 Dry macular degeneration makes up approximately 85-90% of cases of macular degeneration. If you have dry macular degeneration, during the examination of your retina your eye doctor will see small, yellow deposits between the retinal layers, which are called drusen. Dry macular degeneration results in a slow, gradual, progressive “dimming” of your central vision. Many people 50 years of age or older begin to display some drusen as they age. Drusen are not a serious threat to your vision unless they are large or confluent. If you have drusen, your eye doctor may ask you to schedule eye exams more frequently and might even order additional testing such as retinal photographs, optical coherence tomography (OCT) or fluorescein angiography, in order to monitor them, as there is some possibility that dry macular degeneration will progress to wet macular degeneration over a period of time. Thus people with dry macular degeneration, even without any noticeable change in vision, need to be followed closely as wet macular degeneration has far more serious consequences for vision loss. What is “Wet” Macular Degeneration? 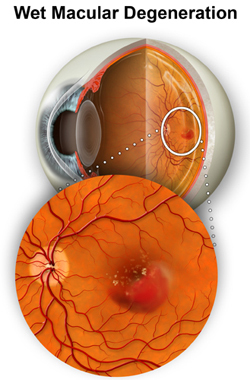 Wet Macular Degeneration is far more likely to cause serious vision loss than dry macular degeneration. Fortunately, “Wet” macular degeneration only accounts for about 10-15% of cases of age related macular degeneration. Wet macular degeneration is characterized by an abnormal growth of new blood vessels under the retina called “neovascularization”. Neovascularization is not made up of “normal” blood vessels in that they are unusually weak in their structure. In fact, they are quite fragile and are prone to be leaky and can easily break and bleed. If leakage occurs, the macula may actually begin to swell. If the new blood vessels break and bleeding occurs, it can result in scarring as it heals which will cause a sudden, rapid and severe loss of central vision, which is irreversible. Depending on the type of macular degeneration and whether any vision loss has already occurred, with early diagnosis it is possible to have a number of treatment options available to help preserve your vision. If you are over the age of 50, or younger if you have any risk factors such as family history of macular degeneration, prolonged daily use of aspirin, excessive alcohol consumption, smoking, or any other types of vascular disease you should make sure that you have a comprehensive dilated eye exam as you may be at greater risk for macular degeneration. Please schedule an appointment for a macular degeneration eye exam by calling Baltimore Washington Eye Center at 800-495-3937. Wet & Dry Types of Macular Degeneration (AMD) at Baltimore Washington Eye Center in Glen Burnie and Gambrills Maryland.